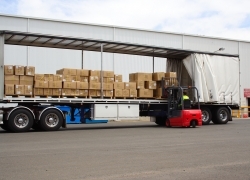 We have over 20 years of experience in the industry, safely moving customer’s products and items around the country. When you need a haulage company to rely on for all your distribution, haulage and storage needs then look no further than D & A Rhead Transport Ltd.
As well as providing a general haulage service we also have the ability to work with hazardous goods. As accredited members of the FTA we are trusted to remove the hazardous goods according to the health and safety regulations and at the same time stay environmentally friendly. These services are available to local and national customers in need of our excellent service and high class customer service skills. Our main aim is to meet all of our customer’s needs and requirements so that they are truly satisfied with the service they receive. Our experienced team work together to bring you a friendly and reliable service that is second to none. The personal approach is what we pride ourselves on as all our customers are always returning to use our services time and time again. We work within the whole of the UK including London, Glasgow, Belfast and Birmingham so that no matter where you are our services can reach you. Call us on 01782 827 036 for more information or to book our services today.